It's the holiday travel season and that means a lot of extra work for some. Just ask the dogs employed by the Transportation Security Administration at airports around the United States. According to a new post in the Federal Register, TSA wants to recruit more canines to sniff your luggage. Information on the company's corporate affiliation, corporate physical location, canine field locations, and information on certifications. SSI acknowledgement, training, and non-disclosure agreement. Letter of intent and affidavit signed by relevant principal(s). Legal documentation describing the corporation, ID verification, and work authorization for specific individuals. Employees of any firm selected would also have to complete background checks and training. PHOTO OF THE WEEK: Maggie, a @TSA explosives detection canine, checks out the blizzard conditions at @Dulles_Airport near #DC. No matter the conditions, Maggie’s canine (and human) TSA colleagues are working hard across the nation to facilitate safe and secure travel. According to TSA, the agency "trains and deploys about 350 TSA-led and local law enforcement-led canine teams per year to operate in the aviation, multimodal, mass transit, and cargo environments." The dogs who do not make the cut in training end up in the agency's adoption program. Lawmakers in the past have had concerns about where the federal government finds its dogs. In a 2017 hearing, Rep. Gary Palmer, R-Ala., grilled TSA officials about the foreign sourcing of dogs used by the agency. 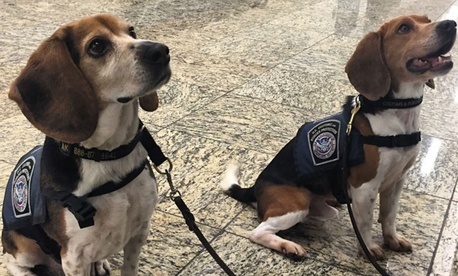 Melanie Harvey, the Transportation Security Agency's threat assessment division director, told Palmer that the TSA "has a large requirement for our large number of dogs" that can't always be filled by domestic suppliers. You can read the Federal Register post here.